If I were to observe the middle-school version of me and spy on her reading habits via her library activities, I would be deeply concerned for her future not to mention current well-being. Among her favourite books were any titles whatsoever by Kurt Vonnegut, and similarly disturbing titles such as "Catch 22" and "One Flew Over the Cuckoo's Nest". One may argue that this is still better than what real-life tortured teen girls went through in other books on her reading list, Christiane F. being one such example. Being only a merger 13 years old meant that these books were not read with a critical adult eye, but rather served as wan encouragement and an inspiration for awkward behaviours, because trying to fit in was not only a lost cause - but also a faulty one. * I'd marvel at anything out of the ordinary and sought different ways to look at the world. Such as focusing on very small details in my pencil sketches, or looking through a blue glass prism to see the world multiplied by its many facets. Blue Diamond is an ancient perfume made by renown Danish chemist and author Steffen Arctander in 1979, and no longer in production. The gracious Heidi, a SmellyBlog reader and a long-time customer, has given me a sample when she was visiting in Vancouver this past summer. I heard about it before through another comment on this blog, but never seen it mentioned elsewhere. Heidi's curiosity about the notes in this perfume piqued my curiosity. She suspected the name "Blue Diamond" alluded to a precious blue flower: The legendary sacred Egyptian blue water lily, which is often mistakenly called "Blue Lotus". She was not far off the mark. Upon opening the vial, a familiar yet mysterious fragrance welcomed me. As I was telling Heidi when I first smelled it - I could smell a high content of natural absolutes in the mix, perhaps tuberose, hyacinth or lotus - but not blue - rather, the pink variety (which is the true lotus). 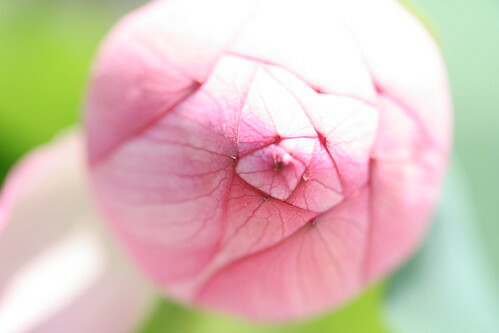 Visually speaking, I can see how a flower may be the inspiration - the unopened bud of lotus looks like a birds-eye view of cut-diamond or sapphire. The other dominant aspect of the composition is aldehydes, of the oily scalp type - C-11 or C-13, giving the perfume a skin-like, awkwardly intimate quality. The perfume is very potent and very long lasting, with the finishing notes being a pleasant cocktail of synthetic white musks. * In modern perfumery terms, such philosophy is found in some awkward compositions, such as Tubereuse Criminelle - which instead of trying to make the tuberose smell pretty, it amplifies its ugly, rubbery and medicinal character and by exaggeration creates something beautiful.